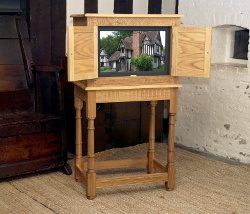 Following the success of the collecting box, Selly Manor commissioned me to build a touch-screen information system, housed in a similar (but bigger) Jacobean oak case. With the doors shut, the unit blends in with the rest of the furniture. Only its light colour marks it out as a modern intrusion. Open the doors, and it becomes a portal to explore the house and enhance the visitor's experience. The system provides historical background on the house and its inhabitants, information on the various rooms, and points out the most significant objects. In addition to text and photos, the system has short video tours of each room. The main problem with taking video in a Jacobean house is that most of the furniture and half the walls are black. Setting up the lighting was challanging, but I cracked it. The system is aimed especially at disabled visitors. There is, alas, no disabled access to the upper rooms. People who can't get up there can at least view the interiors via the new magic box. 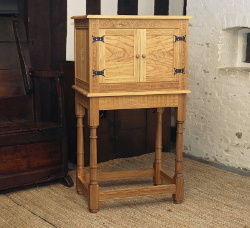 I based the software on Wordpress, so Selly Manor staff can continually update and expand the information. It promises to be a useful and poular addition to the house.